It’s no secret that I love the wines produced in DOQ Priorat to no end. But, there are good producers and then there are those who reach that “moreish” level of enjoyment of which, Mas Doix, in the village of Poboleda consistently does. To date, they’ve only focused on producing reds primarily-based of the local varieties of Grenache and Carignan. When they started 20 years ago, they had a bit more of the French imports such as Cabernet Sauvignon and Merlot but over the years have worked to hone their selection of vines down to three: the aforementioned Grenache and Carignan along with Syrah. While it’s the case that a splash of Merlot can take the edge off young Grenache, the other red grapes of Picapoll Negre, Cabernet Sauvignon, Cabernet Franc, Tempranillo, and Pinot Noir that are permitted really have no place in the region with a double WTF on those last three. Then there’s the irony that Monastrell was left out of the regulations even though it seems ancient documents by the monks made mention of it and it’s permitted in neighboring DO Montsant. Those are the reds though and when it comes to the whites, it’s a bit more subtle in terms of what really “works” and what doesn’t. It’s pretty rare that any varietal white wine knocks my socks off with blends ruling the day, much as is the case in Roussillon and Languedoc. By and large the most common blend you find in DOQ Priorat is White Grenache and Macabeu. Why? Why not Xarel·lo and Chenin Blanc or Vigonier and Muscat (take your pick of either Alexandria or Grain Petit)? It comes down to this being a time-tested blend as the White Grenache brings structure and depth, a rigid skeleton if you will, while the Macabeu fleshes it out a great deal with its blossom-y fruit. White Grenache on its own can be austere (if not from Terra Alta) and Macabeu on its own can be flabby and undefined. So, now that Mas Doix’s top-secret white wine project has come to fruition, it is of course a blend of these two varieties. Despite being from younger vines and really in its infancy (it doesn’t even have a finalized name or label as shown above), it’s still a rousing success. Sandra Doix’s use of lees in the wine has gone a long way to giving a little oomph and soft zest to the wine but in a nice, elegant manner. Is it, “Burgundian” to use an overused descriptor? No, it’s very much a white from Priorat, but it’s at the forefront of those whites which made a hard left turn 5-6 years ago to veer away from the rustic, usually oxidized style of the past and embrace a more delicate, balanced path to the future. 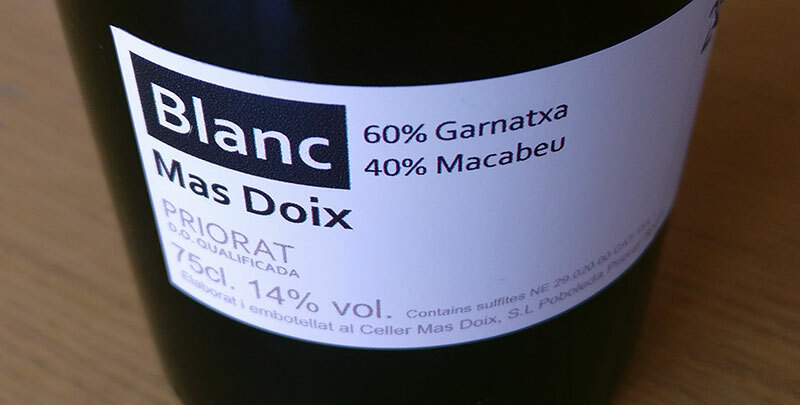 With a minimum alcohol in DOQ Priorat of 13%, these will never be soft sippers for the veranda, but for those who like structured, more full-bodied whites, you might want to consider revisiting what’s being made in Priorat and especially this new “Blanc” of Mas Doix. Yellow peach, red apple peel, white pear, chamomile, mint, fresh stony notes, light touch of brioche from the lees. More sweet green apple on the palate, medium plus acidity, med plus finish. Nice and fleshy without blowing out.